O’Donnell’s recent cases have included the sale of the Los Angeles Clippers for the record-setting $2 billion following a landmark trial removing Donald Sterling, who was banned for life by the NBA, as a trustee of the Sterling Family Trust, and the Stiviano case, in which he set new precedent for married couples and community property. O’Donnell has previously been recognized as one of “The 100 Most Influential Lawyers in America” by the National Law Journal, “The Billion Dollar Litigator” by Variety, and “California Trial Lawyer of the Year” by the Daily Journal. 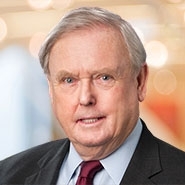 Having handled more than 40 trials and arbitrations and argued more than 24 appeals in federal and state courts around the country, Pierce O’Donnell is the “Hollywood Troubleshooter” currently representing Manuela Herzer in her battle to be reinstated as Sumner Redstone’s health care agent, challenging Mr. Redstone’s competency to remove her in favor of Viacom Chief Executive Officer Philippe Dauman.